You know that this book has to be something special for Gordon Ramsay to have written the Foreword . . . or perhaps it puts you off, making you think the publishers are using his name to sell a book that does not have the qualities needed to succeed on its own merits! Well, you can rest assured that this book does not let Gordon Ramsay or its author, David Everitt-Matthias, down. It is an excellent and very good book, in fact amongst all the food, recipe and cooking books that are published every year this stands out as one of the gems. 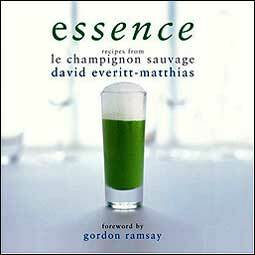 In his Foreword Gordon Ramsay says, "It is a genuine pleasure to have been asked to write the foreword to David Everitt-Matthias' insightful book, Essence." I have to say it was a genuine pleasure for me just to read through this book from cover to cover . . . mind you I did get so hungry that I had to stop for an early lunch. Essence confirmed my worst fears . . . another missed opportunity. I lived in Cheltenham for several years, in fact I moved there the year le champignon sauvage was awarded its first Michelin Star, but somehow or another I never got the time or the opportunity to eat there. Having read the book I now know what I missed! Is this just another Michelin star chef cashing in on his prestigious awards or is it something more? You could be forgiven for thinking so, having randomly opened the book and seen a recipe for 'Cannelloni of veal breast and burdock with celeriac cream, horseradish froth and wood sorrel'. Frightening, and you might even be thinking this book is for professional chefs only. However, you would be wrong! This has to be one of the most exciting and interesting books about food and cooking I have read in a long time. 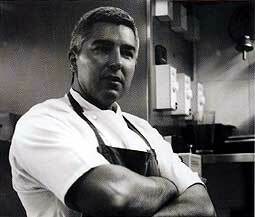 David Everitt-Matthias is no celebrity chef writing a book to fulfil his media commitments or to cash in on TV fame. This is a delightful introduction to the cooking of a great chef and in such a way that you or me can understand the recipes . . . and cook them! None of the recipes are included for show, they are all working recipes included with the intention that anyone should feel capable of cooking them with success. All right, if you have trouble cooking an egg then perhaps this book is not for you. But if you enjoy your food and you enjoy cooking then this book is very much one to add to your collection. There are some truly wonderful recipes throughout, but the book is a great read in itself. 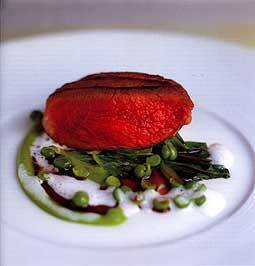 It explains so much about the food and what is involved in the preparation and cooking of each dish. ". . . some of the standbys we use in the restaurant kitchen. 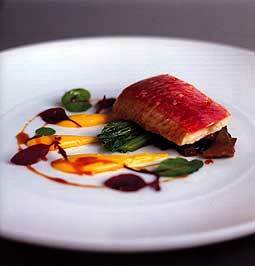 It certainly makes life easier to have them on hand and you'll find they appear in a lot of the recipes in this book." "Good cooking depends on good foundation recipes - for stocks, pasta dough, pastry and so on." Armed with your basics the main section of the book is recipes from le champignon sauvage - starters, mains and desserts. This is one chef who knows how to write a recipe so that his readers can understand it and, because each one is broken down into its individual components, is not at all daunting. Each recipe has its own introduction which explains the dish and how its flavours work together and at the same time provides alternatives to those often difficult to find ingredients. The recipes are then broken down, both for ingredients and method, into the component parts of the dish making the whole thing easy to follow. To really understand how simplified the author has made the recipes you need to have a look at one or two. Would I recommend the book? Definitely. There are some amazing recipes - you cannot fail to learn something new and benefit from this book whether you are a relative beginner or an experienced hand in the kitchen.